Blend ½ cup papaya with all dressing ingredients to form a smooth dressing. Heat oil in a non-stick frypan over a medium heat, cook haloumi for 2 minutes on either side, or until golden. Drain on kitchen paper. 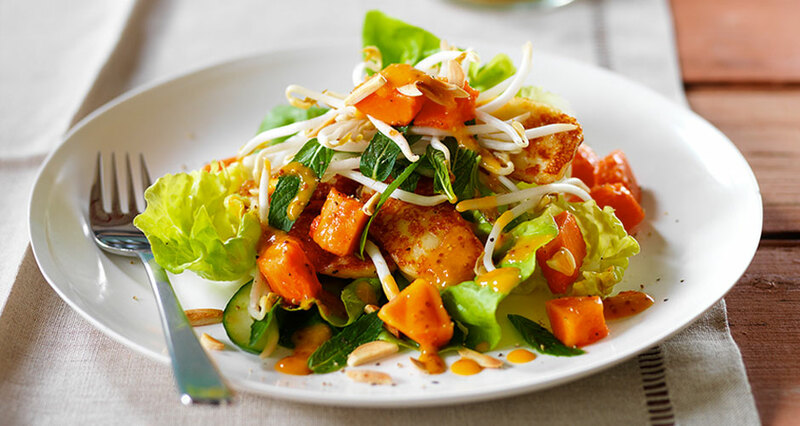 Arrange lettuce on four plates, top with haloumi, cucumber, bean sprouts, mint, and remaining papaya chunks. Sprinkle with almonds, drizzle with dressing before serving. Season with cracked black pepper.